nifty close below 6700 at 6694, infra, metal ,reality, auto, psu bank fail on profit booking, rupee close today positive against dollar at 60.15 , IT and pharma, midcap share gain today. auropharma, apollo tyres, hpcl, reliance infra, oriental bank, hcl tech, infosys, tcs,wipro,cipla , lupin. jindal steel, maruti suzuki, tata steel, sesa stirlite, hindalco, larsen. It was such an nice blog about nifty option with useful and important information. I like this blog a lot it is increasing my knowledge about share market. Very good intraday stock tips are delivered by blog author on this blog. Thanks for helping people with your tips. The Market breadth, indicating the overall strength of the market, was weak. 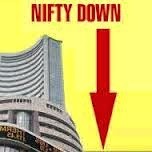 On BSE out of total 3109 shares traded, 1607 shares advanced, 1386 shares declined while 116 remained unchanged.